If you’re searching for an off-the-beaten-path party theme that’s bound to be a blast, think medieval. With princesses in pretty clothes, knights in search of good deeds, castles and mysterious wizards casting spells, what’s not to love? A medieval party is a cinch to put together too. Now, who’s ready to throw down the gauntlet? What Are Some Great Medieval Party Invitations? Get this knightly party started by rolling the invitations into scrolls. Scrapbooking paper works great! Another cute invitation that sets the stage is a castle cutout. The birthday boy or girl can have fun cutting them out or head to a website that sells medieval party supplies. Kids and costumes go hand in hand. It’s why Halloween is such a big hit. 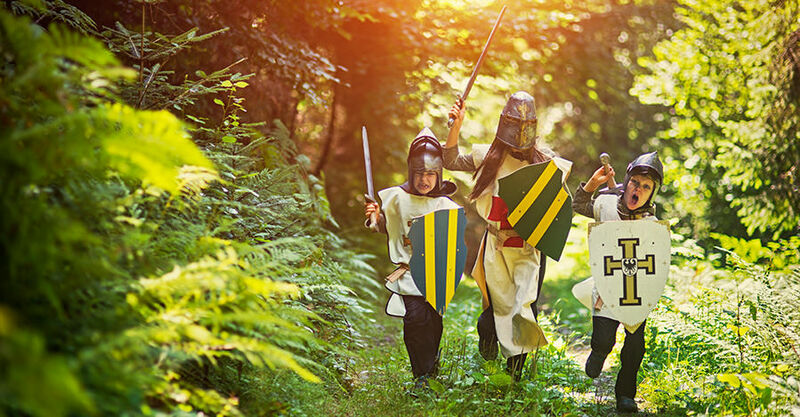 A medieval party is the ideal opportunity to dust off the princess, knight, wizard or witch costumes for another wear. You can even throw together a down-an-out peasant outfit. All you need is a peasant blouse, which works for a girl or boy. Pair it with Capri pants, long shorts or a skirt and you have an adorable peasant outfit. Another way to get kids into the medieval spirit is to have them design their own crowns. Ladies can make flower crowns with pipe cleaners and fabric flowers. Ribbons make a nice touch if you’re making these. Or go the construction paper route and decorate the crowns with markers and fake jewels. 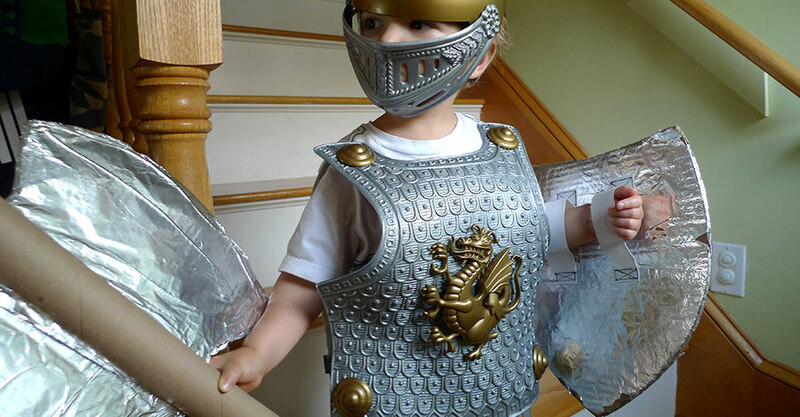 While they’re at it, the kids can fashion some swords from paper or cardboard. They will come in handy at game time. Make sure you include any costume ideas in the invitation. Keep parents aware of anything active the kids may be doing such as running or bouncing. Everyone should be able to participate in their attire. 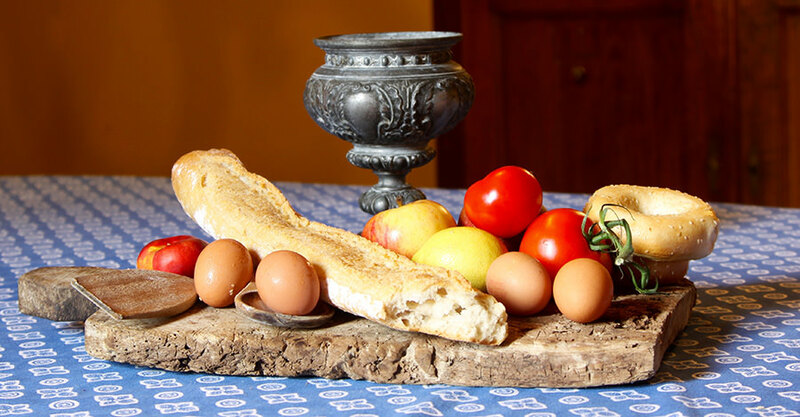 If you’re having a medieval-themed celebration, consider skipping the usual pizza fare and prepare a feast fit for a king! Don’t go crazy and roast a boar, but do have a something like wings or drumsticks. Finger foods are another great option including vegetables and other snacks. Veggies were a medieval staple and you can skimp on the cutlery. Remember medieval folks ate with their hands. Medieval guys and gals mostly drank beer and wine because the water wasn’t fit for human consumption. Since those are obviously out for a kids’ themed party, go for cider or apple juice. Don’t forget to serve it in goblets! What Are Some Great Castle Decorations? Every party needs cool decorations and if you’re going medieval, a castle is a must. Use it as a backdrop against the wall or as a centerpiece. Consider make a cutout to put against a wall or use one of Pump It Up’s awesome bounce castles. A stone wall plastic tablecloth will do nicely, coupled with a pennant banner that sports a medieval crest. For cups use goblets and for tableware go cute with dragon plates and napkins or ones that bear a medieval crest. What Are Some Fun Medieval Games? No party is complete without games. Stage a jousting tournament with pool noodles and hobby horses. Each participant can take turns ‘riding’ his or her horse and attempting to ‘knock’ the opponent off balance with the noodle. If you’ve already made cardboard swords, you’re ahead of the game. 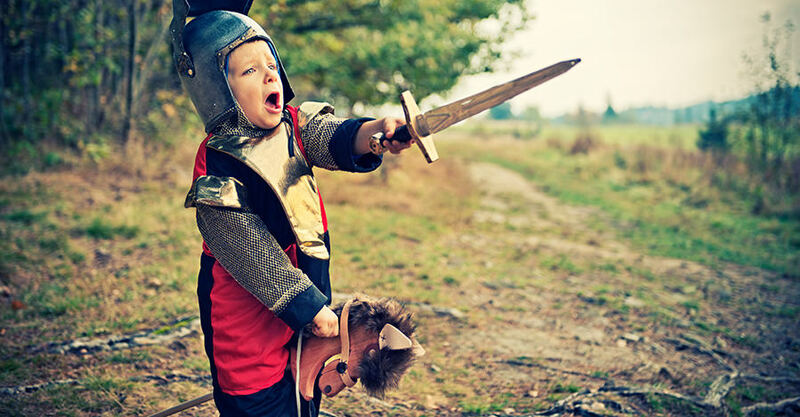 If not, give kids a sword cutout to decorate and let them engage is a bit of sword play when they are all done designing their own. When the party is almost over, it’s time to finally storm the castle for real! Divide kids into teams and see who can take over the castle. Use spongy or soft balls and the team that scores the most direct hits wins. A quick and easy parting gift at the end of the celebration is a goblet filled with treats. Pump It Up even offers princess goodie bags for girl’s birthday parties. For something a little pricier, go for a medieval duckie. He’s courageously cute! Everyone will have a fabulous time at this medieval get-together and won’t want the knight to end! For more awesome celebration ideas, visit out selection of kids’ birthday party tips and tricks.